Originally from Togo, Kossiwa Vanessa Anifrani describes herself as a nomad who feels at home everywhere. Her primary and secondary studies were in Lome and then in Kinshasa (Democratic Republic of the Congo). She also has a foundation in tourism in Louvain-La-Neuve, Belgium and at one point, her fascination with journalism led her to Brussels where she spent a year doing journalistic writing. I had to work very early to support myself; I worked as a host and protocol officer in Kinshasa for Africa Travel. I’ve been in the catering services and events industry and I’ve worked for a French Tour Operator in Paris, Rouen and Brussels. But the work which allowed me to develop myself, create a solid network of contacts in Kinshasa was when I was the waitress and manager of a restaurant named L’Ultime. For Kossiwa, travel is a passion. She has had the good fortune of visiting, living and working in some beautiful places in the world, but she always wanted to be her own boss. After the birth of her daughter, and with encouragement from relatives, she decided to take the plunge into entrepreneurship. Kossiwa enjoys cooking, reading, good music and dancing. A devout Christian, God comes first in her life. Her daughter, who is also the inspiration for her company, Charming Mamour, comes a close second. Charming Mamour is a startup, based in Ghana, that caters to the fashion and beauty needs of pregnant women. We are not officially in operation yet, but the process is underway. My idea is to provide African pregnant women with a variety of clothing options, right here in Africa. We will also have workshops and advice on motherhood. How did you feel when you heard you were one of the selected Tony Elumelu Entrepreneurs and what was the most difficult part about applying? I said to myself, ‘Wow! This is a great opportunity’. The Tony Elumelu Entrepreneurship Programme came at the right time I had already decided to return to Africa to start something, especially something around the welfare of pregnant women. It was a Godsend. During the application, the most difficult part for me was wondering if my idea would measure up. I asked myself whether this was the right project to submit. Everybody thinks of agriculture, farming, education, health or sustainable development when they think of good business ideas. I wasn’t sure that my idea will stand against those. You said you decided to return to Africa and start something new. Where were you before and what were you doing? I was in Belgium working in the tourism sector as a travel consultant and then as a freelancer for Belgian area for a representative office based in Paris. After the birth of my daughter I had trouble finding work because of the current economic situation in Europe. What informed your decision to move back to Africa? It helped that my relatives encouraged my idea. The final decision to move was taken after consulting the heavenly Father and I received the authorization. What is your major business challenge and how do you intend to address it? Like most entrepreneurs, my number one challenge was capital to start up. Luckily, by being selected and participating in the Tony Elumelu Entrepreneurship Program, I will get some capital I need to get started. What is your vision for Charming Mamour? In the next few months, I want to gain more entrepreneurship knowledge, access funding and have connections to eventually find me an investor or partner. In the next three years, I want Charming Mamour to become established in two other countries in West Africa; and in ten years, I want us to become a franchise in other continents. Any words of encouragement to entrepreneurs like yourself? Every entrepreneur must believe their company. You must have the energy and commitment necessary to achieve your objectives, because as an entrepreneur you must work three times harder than others. 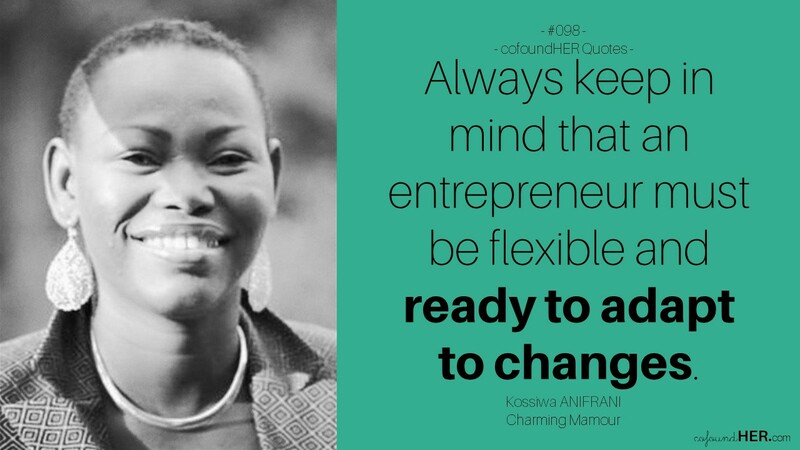 Always keep in mind that an entrepreneur must be creative, innovative, flexible and ready to adapt to changes. In all, you must confide in God and seek His direction. *To learn more and stay up to date, follow Kossiwa on Twitter and Facebook. Business in one sentence: We cater to the fashion and beauty needs of pregnant African women.